Extra thick and delicious chocolate whipped cream is a simple twist on a classic dessert. This 4-ingredient, real food recipe requires no heating, and is sweetened without refined sugar. 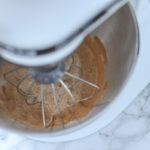 Your family will flip over this chocolate whipped cream recipe… or maybe it is chocolate mousse. 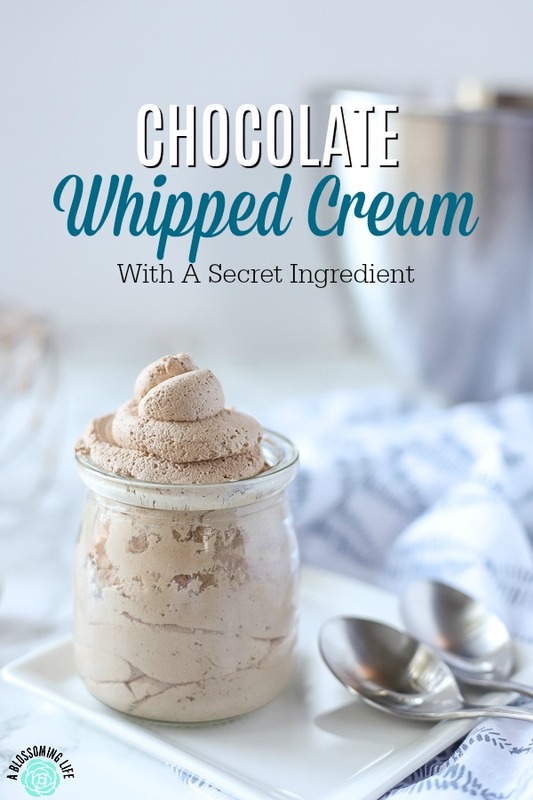 Follow my tips below to make the best chocolate whipped cream mousse ever. Ingredients you will need: whipping cream, cocoa powder, honey, and collagen peptides (optional). I’ve turned my child into a crazy, whipped cream fanatic. How? I made the mistake of getting her whipped cream when going through the coffee shop drive through. Now she constantly asks to get whipped cream, or says “mom, I think you need some coffee from the coffee shop today.” It’s almost like she is being sweet with ulterior motives… hmmm. There is no one to blame but myself. 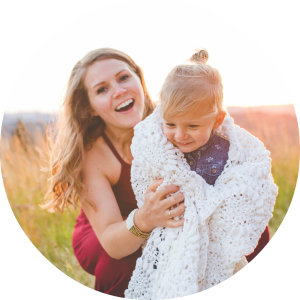 For my family, I love to make simple recipes that have an added nutritional boost to them. It’s so fun to add that one special ingredient that just pumps up the health of a recipe. 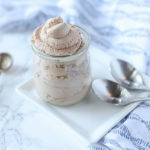 This chocolate whipped cream is one I can feel good about giving to my whipped cream-obsessed child, thanks to a secret ingredient. If you have never used or heard of collagen peptides, they are like gelatin, but can dissolve in hot or cold liquids. They add protein/amino acids to whatever you put them in, and are good for hair, skin, nails etc.. Supposedly it can help with wrinkles, too, and to be honest, I could use ALL the help. Usually, I just put a scoop or two in my coffee each morning, but one day I added some collagen peptides to my whipped cream, and it was so good. It gives the whipped cream an extra thick consistency, making it more like a chocolate mousse rather than just chocolate whipped cream. This really should be called chocolate whipped cream mousse. It’s officially going to be coined as a new term. It works better if your mixing bowl has been chilled for a few minutes in the freezer, but it will still work even if it has not. 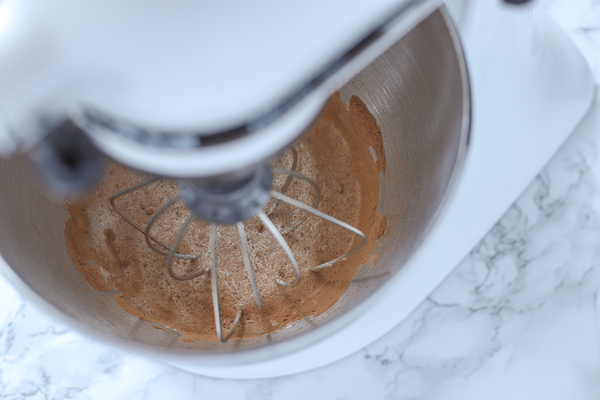 Add all your ingredients to your stand mixer or bowl, and start mixing on a low speed and work your way up to a higher speed. Add more cocoa powder if you want it extra chocolatey, or more honey if you want it sweeter. Skip the chocolate and add a splash of vanilla for a non-chocolate version. Stand mixer or hand mixer, measuring spoons, and silicon spatula. Collagen Peptides – the best price I’ve found by far is at Costco. In a stand mixer or mixing bowl, add all your ingredients. Turn the mixer on low and work your way up to high. Whip until thick and fully. Enjoy with a spoon. Because that is what we do. Want more healthy dessert ideas? Check these out! Paleo Apple Crisp is a warm delicious dessert. Decadent Vegan Truffles are rich, sweet and have an ultra smooth consistency. Gluten Free Blueberry Pie– one of my favorite desserts in the summer when we have farm-fresh picked blueberries. Lemon Custard is a sweet, creamy, and tangy custard made without refined sugar. I like to think of myself as the queen of healthy quick recipes…. Am I? Not really, but this chocolate mousse definitely adds a jewel to my future crown. 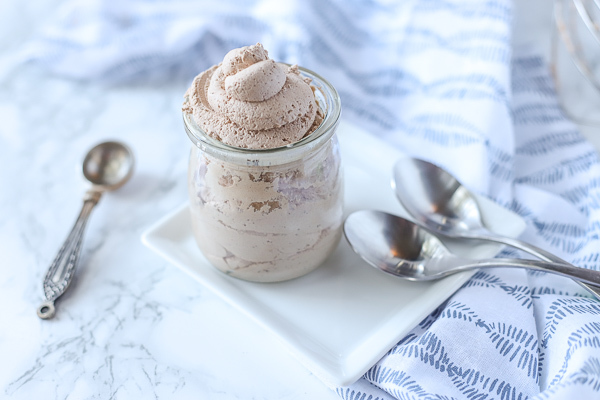 Extra thick and delicious chocolate whipped cream is a simple twist on a classic dessert. 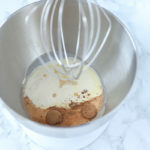 In a stand mixer or mixing bowl add all your ingredients. Do I need to add collagen peptides? No. This is an extra ingredient that I feel gives it a great, thick texture that holds really well. It will just be regular whipped cream without the collagen peptides, and not that super extra awesome chocolate mousse like whipped cream. Which isn’t necessarily a bad thing; just trust me, though, you’ll definitely want to try it with the collagen peptides! 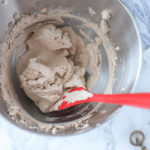 Have you made homemade chocolate whipped cream before? Decadent! This yummy treat will make everyone smile! Mmm everything is better with chocolate! I loooooove chocolate whipped cream. Genius to add in collagen! It makes it so so good. Definitely adds some fluffiness. Oh yum, this looks amazing! I looove whipped cream and I bet it’s even better with chocolate. Oooh! I like this! I have a sensitivity to casein, so the only dairy from cows that I can have is butter and cream. I must say that I’ve taken quite a liking to cream!